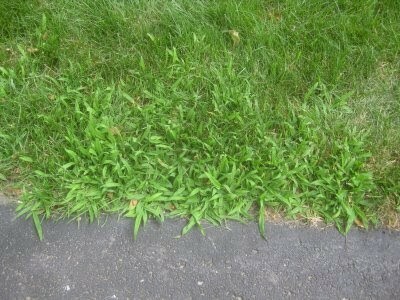 Crabgrass has run rampant in many lawns during the last few summers. 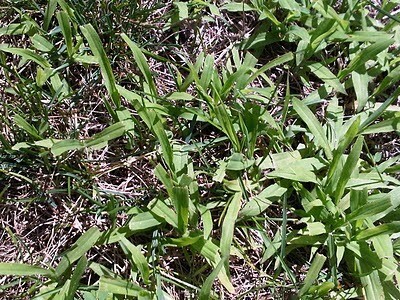 Crabgrass is an annual; each autumn it dies but each spring it comes up from seed. It germinates in mid- May. By the time it is noticeable, you see short, light green grasses along the driveway or walkways and in the thin areas of the lawn. It grows quickly and before long it spreads out flat, often smothering the existing grasses. The leaves are now distinctly hairy and long seed heads develop. As it gets cooler in September the crabgrass turns purple. Later it dies and by spring it is gone. Control of Crabgrass: A healthy, thick lawn will naturally crowd out crabgrass. Regular feeding and aeration help to develop thick lawns to discourage crabgrass and other weeds. Mow the lawn at 2 1/2 to 3 inches high. Water deeply once a week (on average) rather than every other day. Crabgrass can be controlled because it dies in the winter. Products are available that kill the seedlings as they germinate in the spring. If necessary, resod bare spots. Re-seeding will also thicken the lawn. Add grass seed in the fall (as early as late August). Fall is the best time because crabgrass controls can interfere with lawn seed germination. (Normally we avoid putting crabgrass controls on newly seeded areas so as not to damage grass seedlings. Of course, without the control, crabgrass may sprout in these areas). The new seed will fill any spots left thin by the crabgrass. Add the seed even before the crabgrass dies; the crabgrass will protect the newly germinating grass plants. Middle aged crabgrass starting to spread over the edge of the drive.